Contact Chrys at (209) 728-6171 and arrange for lessons on her schedule. Also call 728-1439 or 736-0210. 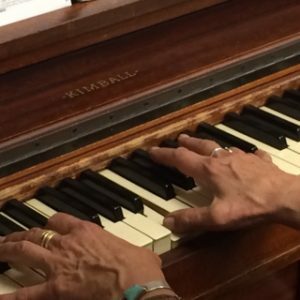 Chrys has over 35 years of experience teaching music both privately and in schools and neighborhoods, with a main focus on piano & keyboards. Chrys Mollett was born with Music & Literature surrounding & enriching her world. She started writing songs at the age of 3 (mostly about clouds, peanut butter, and fish) and began studying music at 5. A grateful escapee from the Inland Empire L.A. County, Chrys spent countless summers & vacations growing up in the foothills, picking berries & wild mushrooms, and helping a family friend work with a dog sled team that raced up what is now Hwy 4. Chrys’s Dad was a WWII Marine hero (see bench dedicated to Bill Mollett in front of the Calaveras Visitors Center in Angels Camp), a writer, and eventually was known as “The Barbarian of Calaveras County” as he held one of the largest collections of barbed wire anywhere. 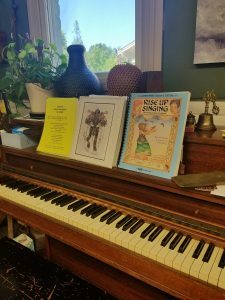 A naturalist and musician herself, Chrys’s mother Mary, taught at Mark Twain school for years. Her parents retired to Murphys in the 1970s, and Chrys relocated here in 1988. Chrys lives on a 5-acre hillside shared with her dog Marley and two cats, sundry wild critters, and a wide view to die for. Her home is a rustic lodge, dubbed “The Chrystine Chapel”, hand-built of local-milled timber gleaned from the Old Gulch Fire in the early ’90s. It is a sanctuary for browsing hungry & thirsty deer, raccoons, squirrels, songbirds, hummingbirds, raptors, frogs, lizards and an interesting array of insects. She sleeps outside under a mosquito net all summer. 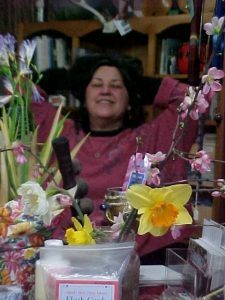 Her home interests include native & edible gardening, watching the seasons’ cycles, learning from trees and the rocky motherlode soil, discovering her own ability to build & repair stuff, dream journaling, painting, and doing the NY Times crossword. In books & movies she prefers anything about “intelligent people making difficult decisions.” Chrys’s brother, Mike Mollett, is a performance artist in L.A., having originated the groups LA Mudpeople and the Karma Bums. His wife Dee works in post-production editing for television. 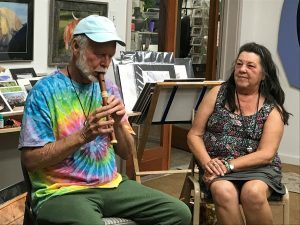 Longtime owner of the Aeolian Harp, oldest running music store in Calaveras County, her business was located for 18 years in Murphys in the old 1891 Valente Building (with no bathroom or plumbing / sheep in the field) and 10 years in Angels Camp. When Chrys moved here in 1988, she was stunned to find No Music Stores in the entire county! She knows the importance for kids to grow up with a small, friendly place to discover instruments and music: to pick up things and see what they do. Chrys’ original vision for the Aeolian Harp included Music – Gallery – Gifts. She is pleased to have found a happy connection to this balance of interests with Manzanita. 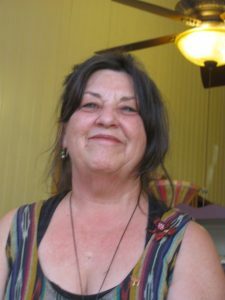 Now a Board Member and resident artist of Manzanita since June of 2017, Chrys has published poetry in Manzanita’s anthologies in the past. 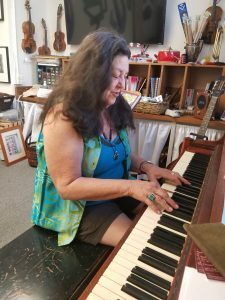 Her own artwork surrounds the piano in the Manzanita Gallery. 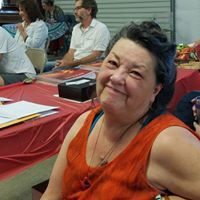 She spearheads the group Song Posse which meets at Manzanita every 2nd through 4th Saturday at 6 pm, to share music, tales, sprouting & veteran talent, and song. Chrys believes in preserving the historical value of Music as a way of understanding our forebears and earlier times. “In GoldRush Days when these old MotherLode towns were built, Everybody played Something, even if it was just slapping your knees” – Music has the grace and power to help build truly healthy young lives; Music teaches both Joy & Discipline, is mathematically delightful; exercises ears, heart, fingers and mind; and in mature folk, helps keep the brain supple. Music channels a connection to our most primal natures. It is a companion in all times. It is a unique expression of our souls’ experience on this societal and personal path.